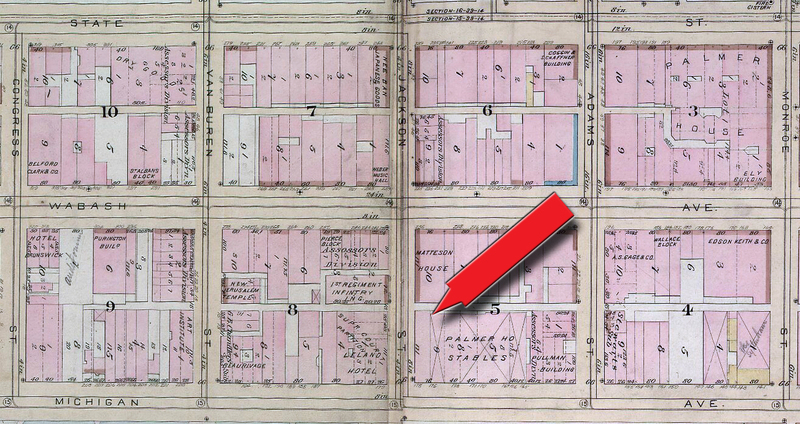 In 1883, with the second wave of building being finished in the Town of Pullman, George Pullman again commissioned Solon S. Beman’s architectural services, this time to design an office building downtown. Instead of the Queen Anne or Second Empire styles Beman used in Pullman, or the Classical styles he would later use at the World’s Columbian Exposition and in Christian Science churches in the 1890s, Beman for the Pullman Building was influenced by the Romanesque preferences of Louisiana-born architect Henry Hobson Richardson, architect of Chicago’s Glessner House. Constructed of red granite, brick, and terra cotta at the corner of Adams and Michigan (across from the Art Institute), the Pullman Building was a massive and imposing structure of 10 stories with turrets and a light well. 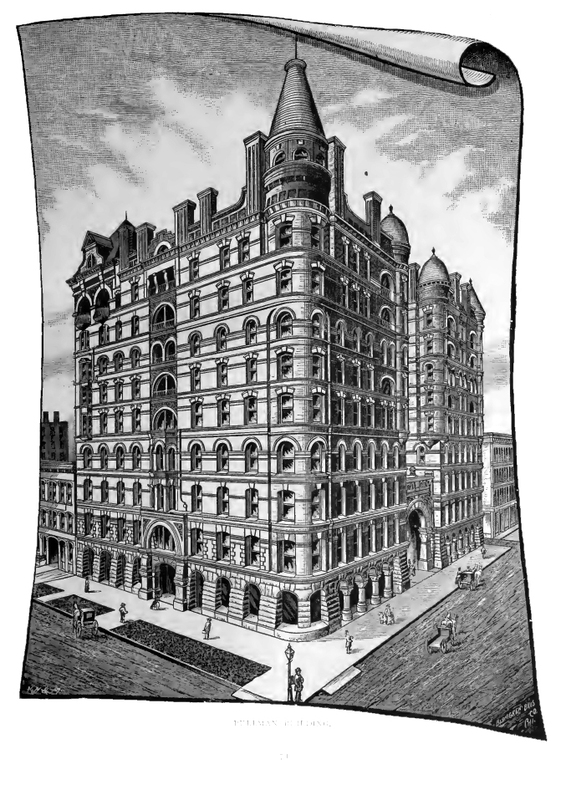 Described by the Chicago Tribune, the design of the building would be a modification of the Norman round arched gothic, modernized and adapted to the peculiar [sic] purposes for which the building is intended, the main object being to give it an expression of dignified elegance in its simple massiveness. As with all buildings built after the Great Fire of 1871, it was advertised as absolutely fireproof. Excavation for the building foundations began in May 1883. 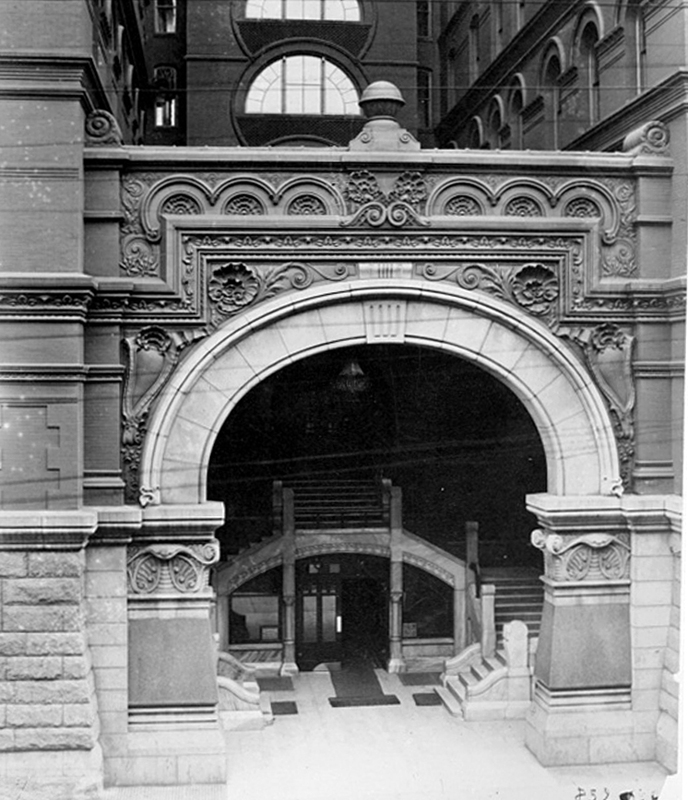 In keeping with First Chicago School of architecture construction, iron beams and joists were used throughout the building; stairways were also of iron; it had four passenger elevators and a freight elevator and both gas and electric light. In March 1884, the outer walls and brick work had been completed. Work came to a standstill as the Bricklayers’ Union decided that the fifty or so tilelayers working on the tile floors and other interior work should demand $4.00 per day rather than the $3.50 they were receiving, and that they should strike if the employer refused the additional wages. The demand was made and refused, and the tilelayers unwillingly left their places and went home, leaving them, as they all contended, well pleased with their pay and disposed to fight the action of the union.The strike also affected work of carpenters and plasterers, so the Ottawa Tile Company issued a notice for non-union tilelayers which quickly were found and work resumed. 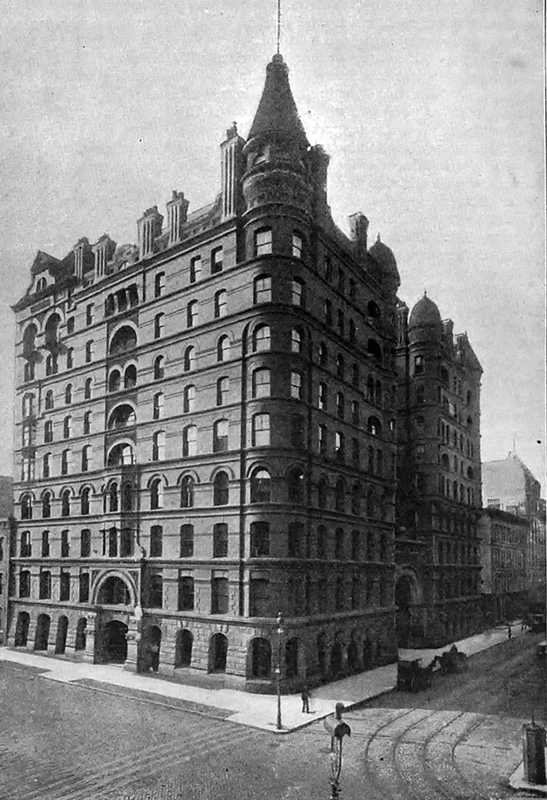 The Pullman Building was designed for multiple use: the first floor for stores dealing in light merchandise, the second and third floors for Pullman offices, the fourth and fifth floors for Army Headquarters of the Division of the Missouri and for telephone company offices (Chicago Telephone Company and Central Union Telephone Company are noted in the floor plans), and the sixth floor for general office space. Beman’s architectural offices were supposedly on the fifth floor. The seventh, eighth, and ninth floors were reserved for residence suites of two, three, and four rooms, with private bath room, closet, hot and cold water for each. These suites are intended for use as bachelor apartments, and for occupancy by small families who wish to avoid the cares of house keeping. No cooking will be allowed in these apartments. Provisions were made, however, for a restaurant on the ninth floor, with the kitchen and servants quarters on the tenth floor. The laundry, steam boilers and electric light generators were in the basement. Separation between the offices and residences of the building were maintained by having separate entrances: offices could be accessed from Adams Street and residential apartments from Michigan Avenue. A light well was open from the glass roof at the third story. The Pullman Building was replaced in 1958 with the Borg-Warner Building.